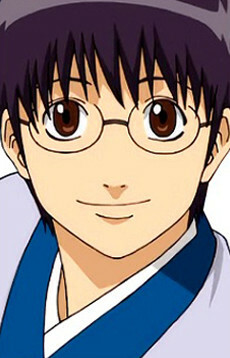 Shinpachi Shimura works under Gintoki to learn the ways of the samurai. He used to stay at his family's dōjo. However, it seems more like he's just trying to help Gintoki pay the rent than to learn. Shinpachi is the captain of the "Otsu's Imperial Guard," a pop singer's fan club. Shinpachi meets Gintoki after Shinpachi was tripped by the ambassador of Planet Chatoran. Gintoki beats up the ambassador and his guards, not to stand up for Shinpachi, but to get revenge for his spilled parfait. Gintoki frames Shinpachi for the crime, which somehow led to him saving Shimura Tae (Otae), Shinpachi's sister, from becoming part of a brothel. Despite his meek appearance, Shinpachi is a more than competent swordsman of his family's Kakidō-Ryu, the type of swordsmanship his dojo teaches. In the character popularity poll, he was in 8th place. His name is roughly based on Shinsengumi member Nagakura Shinpachi and comedian Ken Shimura.